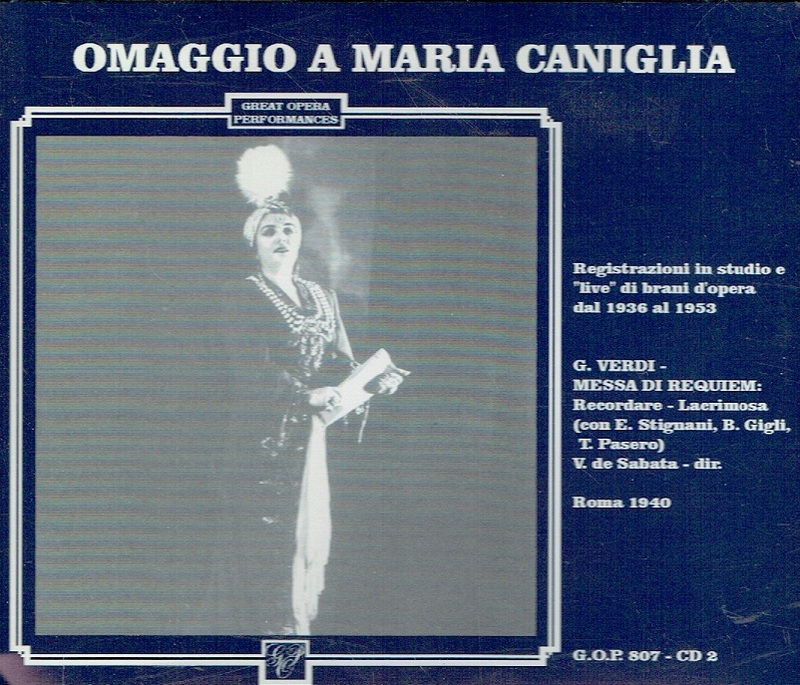 “Regarded by many as having had the most beautiful spinto soprano between the primes of Claudia Muzio and Renata Tebaldi, Maria Caniglia was chosen to record a number of major soprano roles, several of them with Beniamino Gigli. Her generous temperament sometimes led her to dramatic overemphasis and her technique sometimes failed her in the topmost register, but she was always a vivid presence, always committed to giving her all in performance. When Tebaldi and Callas divided La Scala audiences, Caniglia became the Prima donna Assoluta in Rome. "Generous of voice, if a bit hard-edged, Caniglia indulges in true, over-the-top Italian vocalism, pulling out all the emotional stops – a perfect complement to Gigli and Lauri-Volpi."